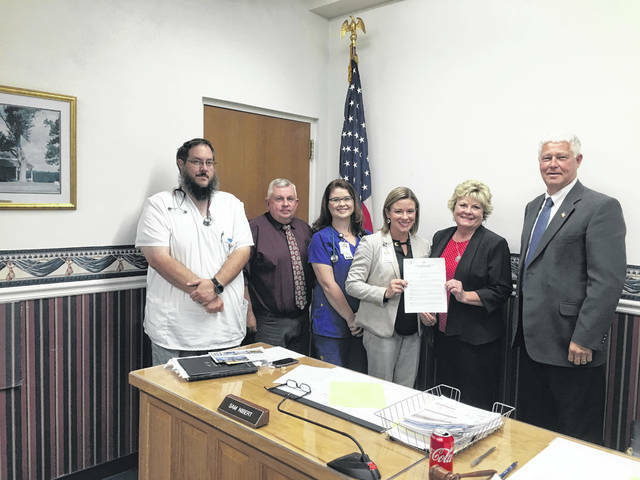 The Mason County Commission recently proclaimed November as National Home Care / Hospice Care month. Sara Gore, community educator - home health at Holzer Health System, explained the purpose of this month is to bring awareness to the multitude of nurses, home care aides, caregivers, therapists, social workers, and all other professionals of in this line of work and the work they do for their patients. Those pictured from left to right are John Hesson, Commissioner Sam Nibert, Amanda Johnson, Sara Gore, Commissioner Tracy Doolittle, and Commissioner Rick Handley. The Mason County Commission recently proclaimed November as National Home Care / Hospice Care month. Sara Gore, community educator – home health at Holzer Health System, explained the purpose of this month is to bring awareness to the multitude of nurses, home care aides, caregivers, therapists, social workers, and all other professionals of in this line of work and the work they do for their patients. Those pictured from left to right are John Hesson, Commissioner Sam Nibert, Amanda Johnson, Sara Gore, Commissioner Tracy Doolittle, and Commissioner Rick Handley.